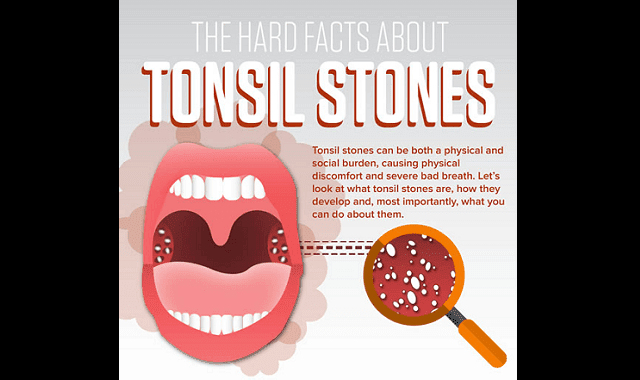 The Hard Facts About Tonsil Stones #Infographic ~ Visualistan '+g+"
Do you have bad breath? Do you brush, floss, and rinse regularly and people still run away from the green, misty odor that escapes every time you open your mouth? Do not fear! The cause may be something your not even thinking about, or have never even heard of for that matter. Tonsil Stones affect between 6 and 10% of the population EVERY SINGLE YEAR. Most people don’t know about these foul smelling nuisances. They present themselves as small, cream colored lumps, and are formed from the accumulation of debris and bacteria. Although hidden tonsil stones do cause a number of other noticeable symptoms besides the smelly green dragon. Some of them are sore throat without being sick, frequent coughing, and a metallic taste in the mouth. The thing with tonsil stones is you can have a completely healthy dental routine, and they can still show up. Want more information?? Check out the infographic below!